You are welcome to look, read, study, and learn. you are welcome to link/share it. you are welcome to quote or rewrite 1 or 2 sentences of my post (not all of them), but please don't forget to mention me/link my site. The posts in this blog with pdf download for the knitting patterns I created are contain some content locker. You can access the PDF file after you unlocked it by fill one of the advertisements requirement presented to you. All advertising is in the form of advertisements generated by a third party ad network. This time, we have a lovely girl who so kindly will share a free knitting pattern to all other knitters! 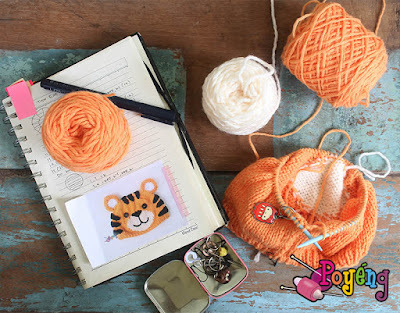 The Indonesian-language's version of this free knitting pattern already shared on Poyeng blog, and here she kindly shared the English-language's version. - 2 skeins bulky bandung yarn (Or another super bulky yarns). - 1 set double pointed needles size 6 mm. - K1 P1 (Ribbing) till end of row. Repeat this row untill the ribs measures 3 inches. - Slip 1st-16th and 59th-74th stitch into DPN set (32 stitches). Leave 42 other stitches in circular needle or put into the holder. - Work this 32 stitches in round. Knit 23 rounds or untill the ear measures 5 inchi. Slip 22th-53th stitch into DPN set. Work as the Bunny Ear 1. There will be a gap in the top of the hat between the ears. With the wrong side facing you, sew the remaining 10 stitches with Three Needles Bind Off technique. 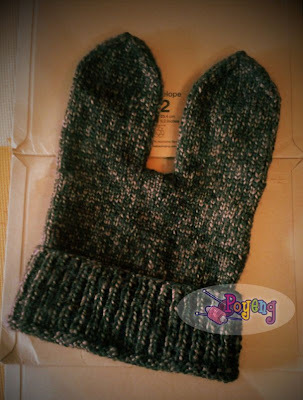 One of our knitter friend already try this pattern and change the size into baby size, by change the needle into 4 mm (US 6) and use light worsted weight yarn. If you want to ask or anything about this pattern, you can comment here and i will pass it to Wina. How to: My steps on making knitting pattern. This work by ajeng sitoresmi is licensed under a Creative Commons Attribution-NonCommercial-NoDerivs 3.0 Unported License. Permissions beyond the scope of this license please contact us at poyenghobby.